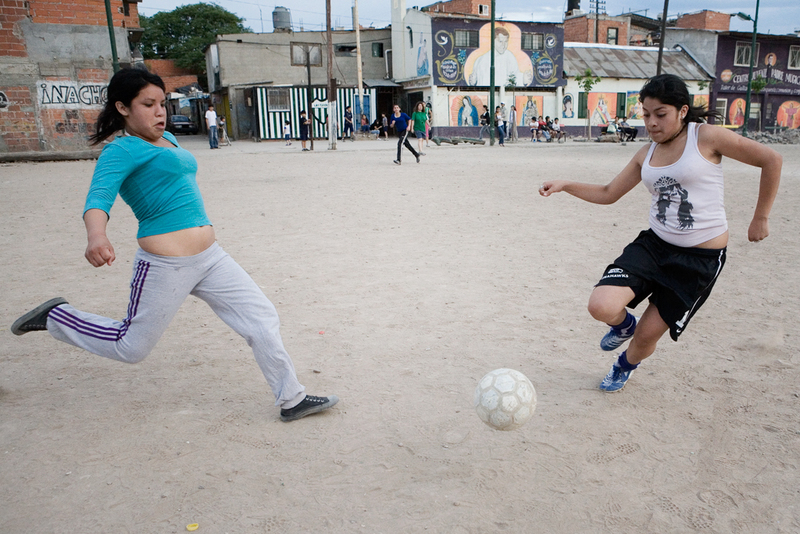 Goals for Girls follows the struggle of a group of girls from the infamous Villa 31 shantytown in Buenos Aires who want to play a sport that is off limits to women in Argentina: soccer. With humor and colorful imagery, this documentary explores what it takes for girls to score goals on the field and reach their life goals when their families and society sees them only as future maids, criminals or teenage mothers. Goals for Girls follows these girls as they confront the boys who don´t respect their rights to use the field, learn the value of teamwork and organize an inter-slum championship themselves—that they also want to win! The experiences of these “slum soccer girls” will not only be documented by filmmakers who have been following them since 2008, but the girls themselves will contribute though a video workshop where they will learn how to interview and do basic camera work. The audience can get uncensored view into their world and the girls will begin to take back the narrative of their own lives. At times raw, funny and always full of surprises, the protagonists of Goals for Girls will show young people all over the world that realizing goals requires more than hard work, it also requires the support of a team. Co-directed by Ginger Gentile, a native New Yorker who has lived in Argentina since 2002, and Gabriel Balanovsky, Argentine and with more than 15 years experience as a filmmaker. The film has received a funding grant from the INCAA, Argentina Film Institute. We have also started a video workshop for the girls so they can participate in the documentary and learn a marketable skill, and have received many donations from the people all over the world, including video equipment and computers so that the workshop will keep growing. The documentary and the video workshop operate as a non-profit making donations tax-deductible in the US under the fiscal sponsorship of Soccer Without Borders. This sounds fantastic and I can’t wait to see it – I work for an international soccer film festival called ‘Kicking and Screening’ – please get in touch via my email – we’d love to help in any way we can spread the word about the film and need for funding. Hi, this is Miwako Kikuchi from Short Shorts Film Festival & Asia in Japan. We have launched a special program “Football Program” and like to obtain a DVD copy of your film for consideration. Please contact me via email if you are interested.